Samsung India has announced the MyDream project, a research study in collaboration with UNESCO MGIEP (Mahatma Gandhi Institute of Education for Peace and Sustainable Development) and Navodaya Vidyalaya Samiti to find out how to enhance learning outcomes for middle school students in India and how their stress levels can be reduced. In a separate partnership with the Andhra Pradesh Government, Samsung announced setting up of Samsung Smart Class at 14 government colleges across Andhra Pradesh which offer Bachelors of Education (B.Ed) and Diploma in Education (D.Ed) courses. 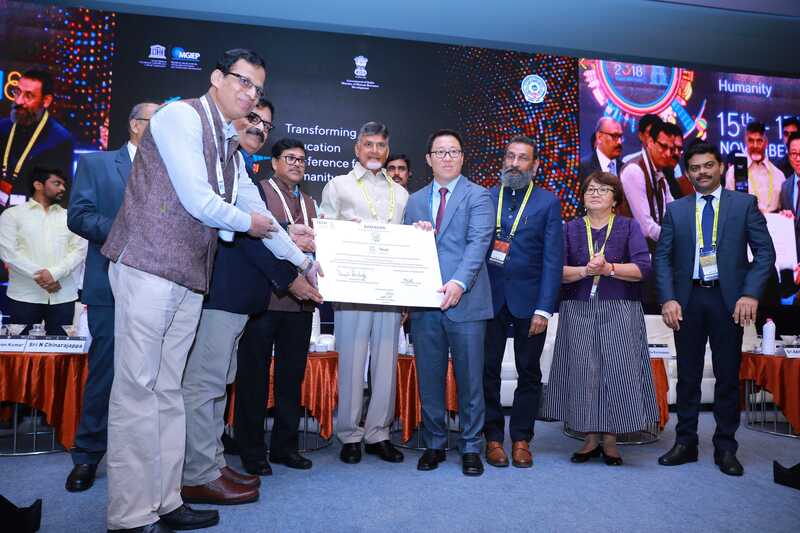 The 14 Samsung Smart Class will deliver 200 hours of course curriculum that is being developed for the Andhra Pradesh Government under the UNESCO MGIEP initiative ‘Teaching Teachers for Technology’. The course is been developed by UNESCO MGIEP so that future teachers can be effectively trained to teach students with the help of the latest technology using digital pedagogies. Under the MyDream project, Samsung and UNESCO MGIEP will conduct a two-year research study at Jawahar Navodaya Vidyalaya (JNV) schools across India. This study is designed to understand how project-based and socio-emotional learning (SEL) can be used to drive learning outcomes of students as defined by their Mathematics and Science scores measured by Jawahar Navodaya Vidyalaya and also to reduce their stress levels. “Through the My Dream project, UNESCO MGIEP wants to build intellectually and emotionally resilient young people. We seek to make learning fun and stress free, and training young people to be mindful, empathetic and compassionate. This research project will help us understand how learning outcomes for students can be improved and how their stress levels can be mitigated. This partnership between UNESCO MGIEP, Navodaya Vidyalaya Samiti and Samsung will pave way for not just an impact in India, but a global one,” said Dr. Anantha K Duraiappah, Director, UNESCO MGIEP. For the study, 64 Jawahar Navodaya Vidyalaya schools, where Samsung already operates a Samsung Smart Class, have been chosen. “My Dream project in association with MGIEP and Samsung is likely to add impetus in furthering the digital pedagogy and increase digital competitiveness for India. Navodaya Vidyalaya being a residential system, introduction of project-based learning and social & emotional learning through Samsung Smart Class digital platform will give a strategic direction in reducing perceived academic stress amongst children,” said Mr. BK Singh, Commissioner, Navodaya Vidyalaya Samiti. “Samsung is proud to partner with UNESCO MGIEP and Navodaya Vidyalaya Samiti on this groundbreaking research that seeks to transform education that will empower children with skillsets for the 21st century,” said Mr. Peter Rhee, Corporate Vice President, Samsung India. The partnership with Andhra Pradesh government for setting up Samsung Smart Class at 14 B.Ed and D.Ed government colleges across Andhra Pradesh seeks to help teachers adapt transmissive teaching that digital technologies have to offer and bring in behavioral and attitudinal shift towards integrating these new educational possibilities offered by technology with curricula and lessons in focus. “AP Government is going to introduce digital instruction design and training as part of the B.Ed course with 200 hours of curriculum developed by UNESCO MGIEP. Samsung has been an enabler in this endeavour by equipping all government B.Ed and D.Ed colleges with Samsung Smart Class,” said Mr. Adityanath Das, Additional Chief Secretary, Education, Andhra Pradesh Government. Since the first Samsung Smart Class was established in 2013 in association with Navodaya Vidyalaya Samiti, over 2.5 lakh students have benefitted from it. In addition, over 8,000 teachers have been trained on how to use interactive technology to teach effectively, improving the quality of teaching and building capacity at government schools. It has improved student familiarity with technology and has helped students learn complicated concepts more easily.